Happy Cyber Monday everyone! I know, the only time it’s actually exciting on a Monday! I am absolutely loving this sequin sleeve sweater from Ruby Bloom. It is so comfy, and the sequin sleeves are just to die for. The perfect sweater for the holidays or even all winter, and you can still feel all snug and cozy in a soft sweater. Did I mention it’s fully lined and soft as can be in the inside? You can grab yours ON SALE at Jane.com today for their amazing Cyber Monday sale! Happy Shopping, and make sure to take a look at my list of Cyber Monday deals going on now! and now… here are my favorite CYBER MONDAY sales going on today only!! These deals are fantastic, so hurry before it ends!!! 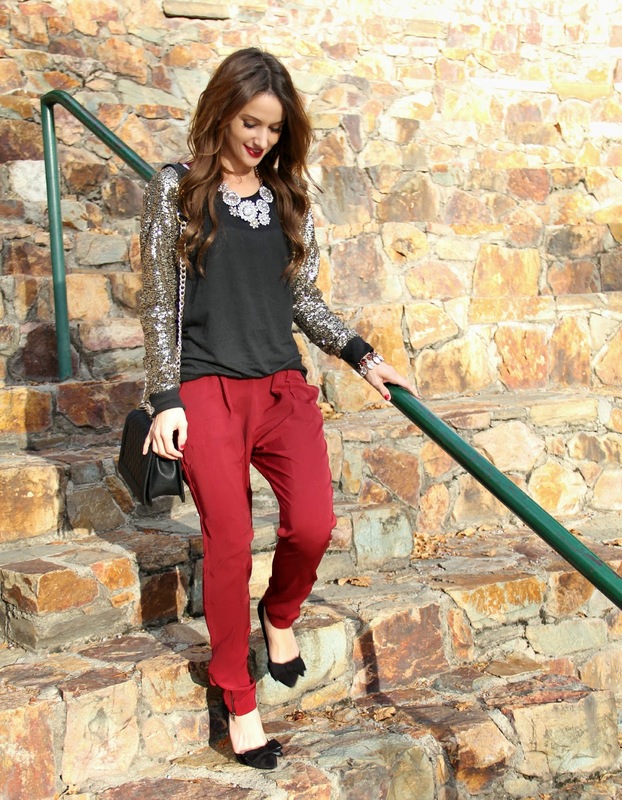 I love that glitter sweater, such a great piece for the holidays!! What an adorable look! The colors are just perfect for the holidays! Thank you for sharing! Love this glam sweatshirt! Perfect for this time of year. Lovely!! Love this combination of red and black and gold! Those pants are lovely! Love this whole outfit, especially that top! So cute!